Eindhoven, The Netherlands – Royal Philips (NYSE: PHG, AEX: PHIA) today announced the 500th member to its LED Luminaires and Retrofit Bulbs Licensing Program, representing an increase of 100 licensees over the past nine months and 200 licensees since May 2013. The tremendous success of the Licensing Program, which provides access to 224 inventions and 1,392 granted patents to companies that sell their own branded LED products, is reflective of the rapidly increasing share of LED based sales in the lighting market. Launched in 2008, the LED Luminaires and Retrofit Bulbs Licensing Program is further evidence that LED technology is becoming increasingly important to all lighting applications, particularly in outdoor and indoor LED based general illumination and replacement LED lamps. These areas have seen rapid growth as conventional lighting technologies are gradually phased out. 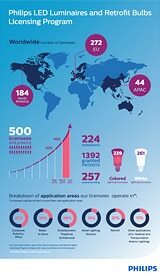 The new area of smart LED lamps is also seeing a strong upward growth trend in the sector. As the market leader and pioneer in LED lighting, following more than 15 years of research and development in this field, Philips is dedicated to opening up the potential of LED lighting to companies and customers globally. The LED Luminaires and Retrofit Bulbs Licensing Program has a global reach and is growing in line with market trends and licensee demand, with a global team that services licensees from inside their own local market, conducts increased communications activity and a has greater presence at global events. The signing of the 500th licensee follows earlier agreements between Philips and other companies including: Acuity Brands, Cooper, Cree, Dextra, Dialight, Lemnis Lighting, Martin, Neo-Neon, Osram, Paulmann, Trilux and Zumtobel. Through the Licensing Program, licensees are given access to a wide range of basic LED control and system-level technologies available for use in their branded LED-based luminaires and retrofit bulbs for general illumination, architectural, entertainment and theatrical markets. Additional information is available at www.ip.philips.com/licensing/ssl.